Light displays are one of the best parts of the holiday season. Driving around to see various neighborhood Christmas lights all around Little Rock makes for a holiday-perfect evening. But there are also stunning public displays in and near Little Rock Arkansas. Here are a few of the best to brighten up your holiday season in December 2018. 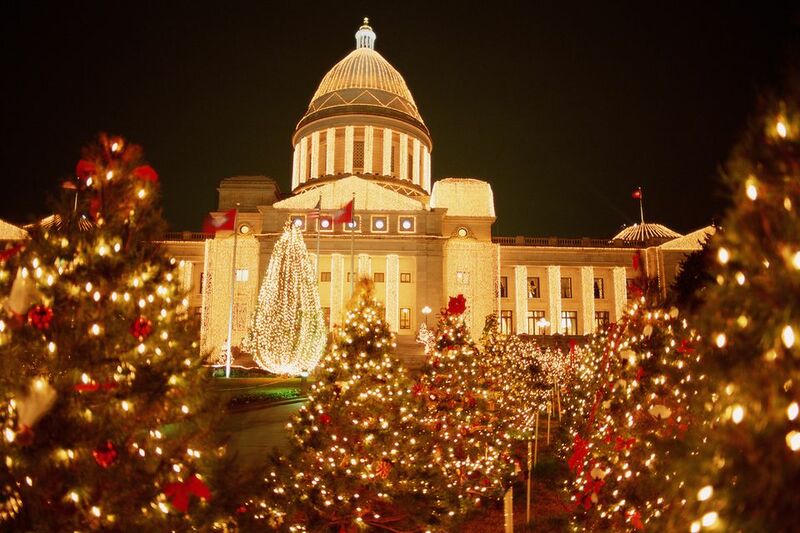 The state Capitol building of Arkansas in Little Rock is ablaze with lights for the 2018 holiday season all through the month of December, and they are a must-see. As an added attraction, the inside of the Capitol is decorated for the holidays, and you can go inside and have a look around during regular business hours. 2018 marks the 80th anniversary of the lighting ceremony, which will be held on Saturday, December 1. The free event starts with the Little Rock Big Jingle Jubilee Holiday Parade, then has the lighting at 5:30 p.m. followed by a fireworks display, a performance by the Gospel Mass Choir, story time for the kids, and visits by Santa and Mrs. Claus. The Capitol will be open Monday through Friday from 8 a.m. to 9 p.m., and on weekends and holidays from 10 a.m. to 9 p.m. throughout the holiday season. The Promenade has a great Christmas display in the center of the shopping center with an animated tree that flashes a light show to music. In 2018 the Promenade at Chenal will celebrate its 25th anniversary of the holiday light show. Starting November 25 and continuing through December 26, you will see several tree lights shows every hour as well as live performances between 5-9 p.m.
Visit Sherwood Forest in Sherwood, about a 15-minute drive from Little Rock, for a 1.5-mile drive-through stretch of holiday lights. The 90 light displays will be shining brightly from 6 to 9:30 pm. every night from November 26 to December 30, 2018. Enter the free display at the Sherwood Sports Complex on Bear Paw Road. Lights of the Ozarks may be a long drive--it's nearly three hours from Little Rock--but it's worthy of a holiday weekend getaway. Fayetteville's downtown square comes to life with 450,000 lights starting Nov. 17 and continues until Jan. 1, 2018. Carriage ride, pony rides, hot chocolate, and holiday music in the background add up to a memorable and photo-worthy event. About 45 minutes from Little Rock, this light display at the Jefferson County Regional Park in Pine Bluff is in its 22nd season. The 1.2-mile event is the state’s largest drive-through holiday lights display. It runs every evening at 6-9 p.m. from November 20 to December 31, 2018. Admission is free, however monetary donations are accepted by volunteers following the tour. Donate $10 and receive an ornament (while supplies last).